The Spur-winged Goose is a large bird in the family Anatidae, related to the geese and the shelducks, but distinct from both of these in a number of anatomical features, and therefore treated in its own subfamily, the Plectropterinae. It occurs in wetlands throughout sub-Saharan Africa. This species often occurs in open grasslands with lakes, seasonal pools, rivers, swamps and river deltas. Large inland rivers and lakes are perhaps most commonly inhabited, with saline lakes and upland areas generally being avoided, although the species can occur to an elevation of 3,000 m in eastern Africa. It is also absent from arid zones. The spur-winged goose is a common bird of African wetlands. Perhaps the main threat to the species is development and destruction of wetland habitats and unregulated hunting. 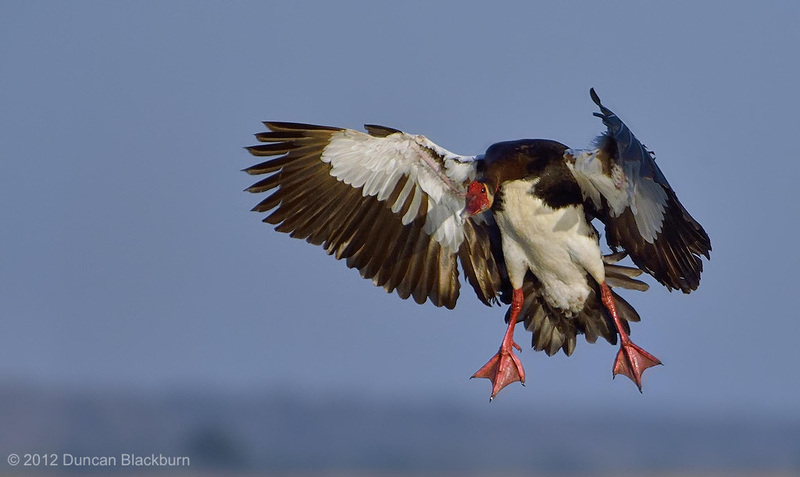 This bird is one of the species to which the Agreement on the Conservation of African-Eurasian Migratory Waterbirds (AEWA) applies. This guy was having a peaceful cruise around Sunset Dam, Kruger National Park, South Africa. This is a whistling duck that breeds in sub-Saharan Africa and much of South America. This species is gregarious, and at favoured sites, the flocks of a thousand or more birds arriving at dawn are an impressive sight. As the name implies, these are noisy birds with a clear three-note whistling call. This species has a long grey bill, long head and longish legs. It has a white face and crown, and black rear head. The back and wings are dark brown to black, and the underparts are black, although the flanks have fine white barring. The neck is chestnut. All plumages are similar, except that juveniles have a much less contrasted head pattern. 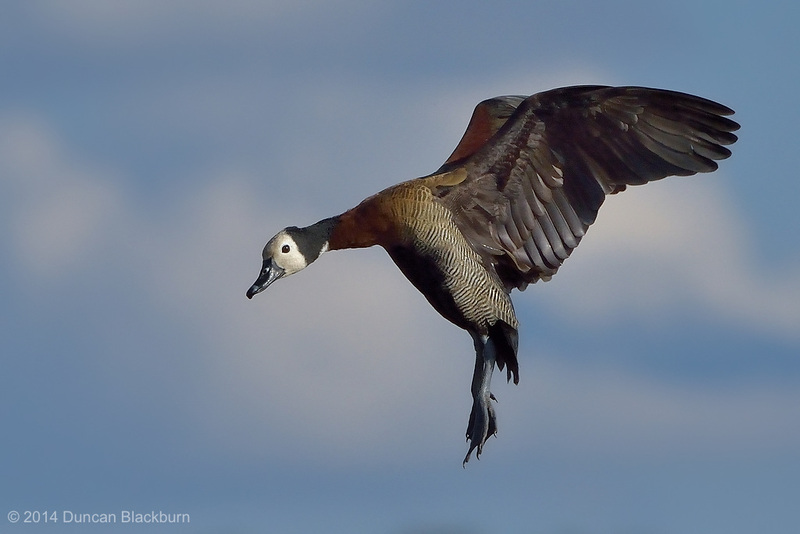 The white-faced whistling duck has a peculiar disjunctive distribution, occurring in Africa and South America. It has been suggested that they may have been transported to new locations by humans. The habitat is still freshwater lakes or reservoirs, with plentiful vegetation, where this duck feeds on seeds and other plant food. The Bateleur is a medium-sized eagle in the family Accipitridae. 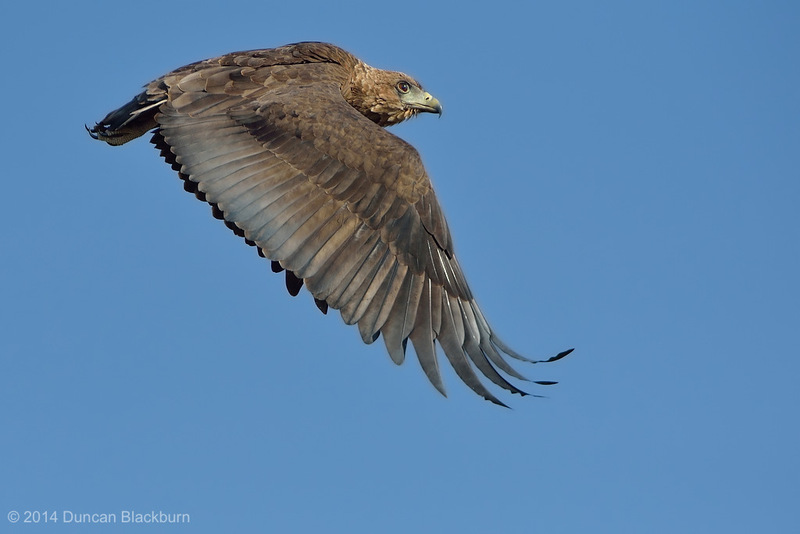 Its closest relatives are the snake eagles. It is the only member of the genus Terathopius and may be the origin of the “Zimbabwe bird”, national emblem of Zimbabwe. It is endemic to Africa and small parts of Arabia. 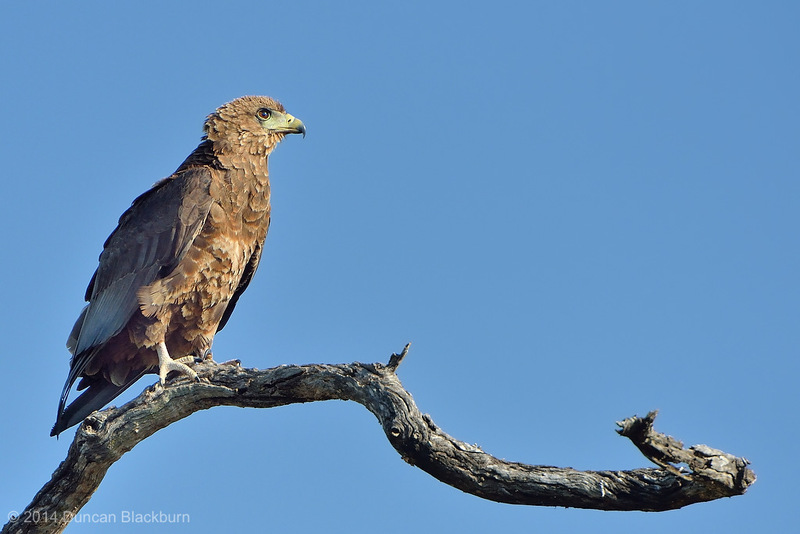 The Bateleur is a colourful species with a very short tail (ecaudatus is Latin for tailless) which, together with its white underwing coverts, makes it unmistakable in flight. The tail is so small the bird’s legs protrude slightly beyond the tail during flight. The Bateleur is sexually dimorphic; both adults have black plumage, a chestnut mantle and tail, grey shoulders, tawny wing coverts, and red facial skin, bill and legs. The female additionally has tawny secondary wing feathers. Less commonly, the mantle may be white. Immature birds are brown with white dappling and have greenish facial skin. It takes them seven or eight years to reach full maturity. 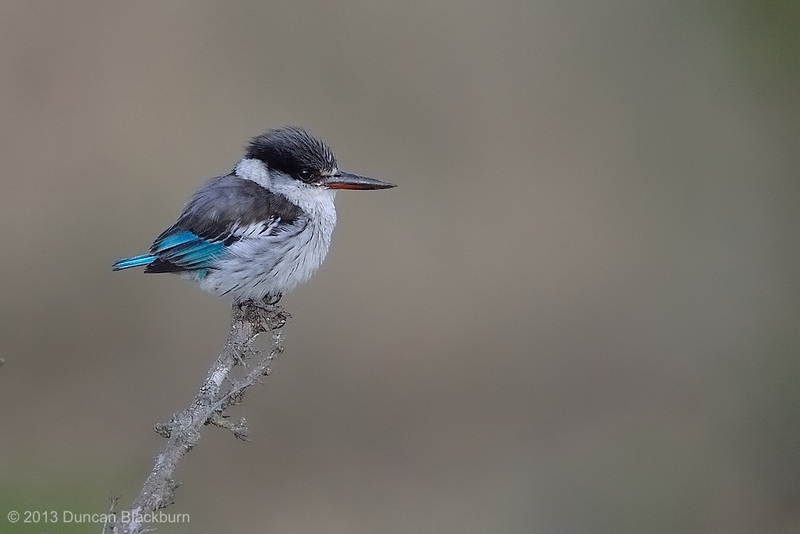 This is the largest Kingfisher in Africa, where it is a resident breeding bird over most of the continent south of the Sahara Desert other than the arid southwest. The Giant Kingfisher is 42–48 cm (16½-18⅞ inches) long, with a large crest and finely spotted white on blackupperparts. The male has a chestnut breast band and otherwise white underparts with dark flank barring, and the female has a white-spotted black breast band and chestnut belly. 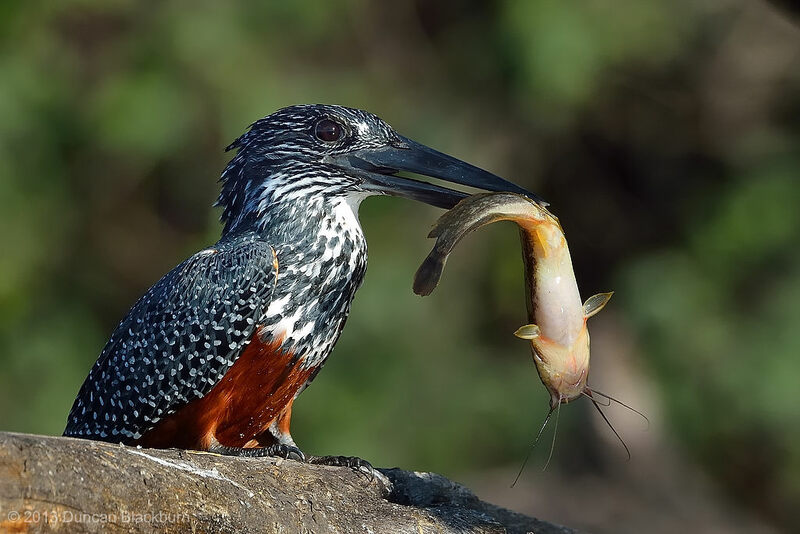 This beautiful example of this wonderful Kingfisher has caught her dinner, but is wondering how best to deal with what is a relatively large baby catfish. 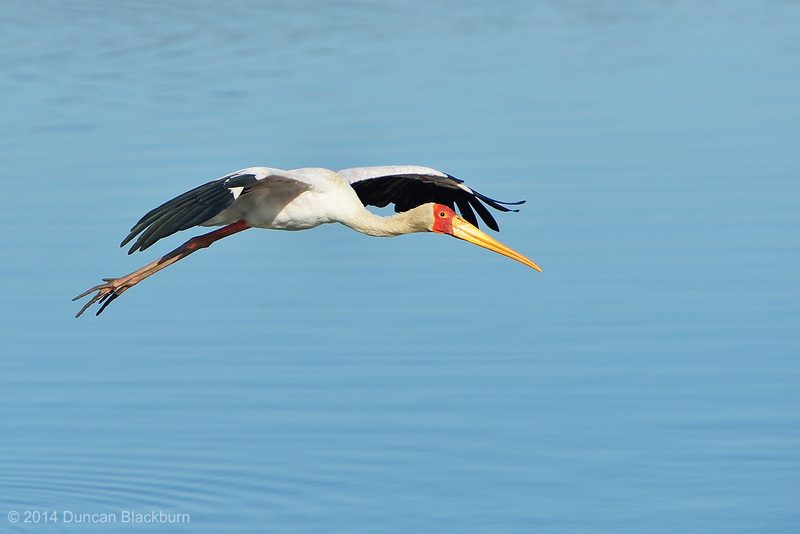 This late afternoon image was captured on the Chobe River, near Kasane, northern Botswana, Southern Africa. These beautiful animals are, of course, one of the deadliest predators on the plains of Africa. In the Masai Mara this is no exception and is very evident. Together with the other large predator cats, the lion and leopard, they wreak havoc among the migrating herds of Wildebeest (Gnu), Zebra, Topi and Thomson’s Gazelle. They are known for two particular discriminating features; they are the fastest land animal – accelerating 0-100 kph in 3 seconds and reaching a top speed of 120 kph (75 mph) over short distances; and they are the only large cat that has retractable claws. They are particularly fond of sitting on termite mounds to survey their surroundings. The East African animals seem to be much lighter in colour than their Southern African cousins. 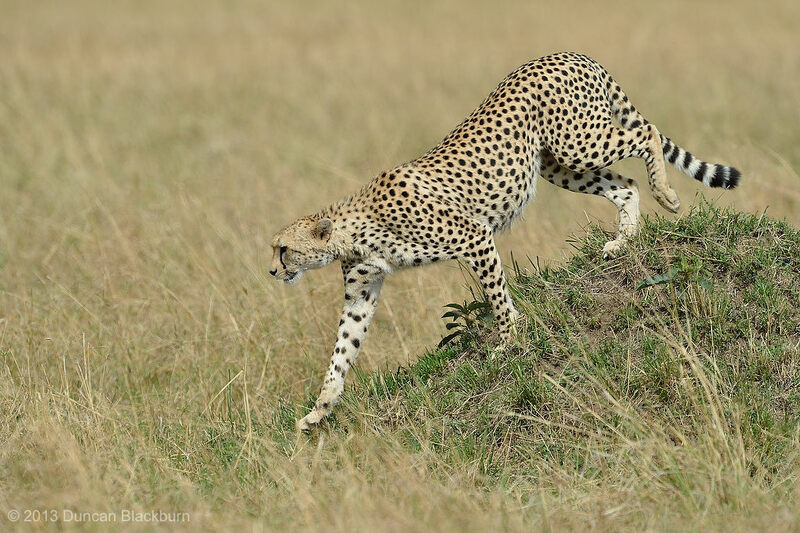 Cheetah are included in the IUCN list of Vulnerable Species. Not all the wildlife in the Masai Mara is large, predatory or migratory. This little guy is a highly territorial bird which will chase off not only others of the same species, but also shrikes, doves and rollers. The territory may be up to three hectares (7.4 acres) in size, and hold 100 tall trees. It is surveyed from a treetop by its owner, who sings from before dawn intermittently until after midday.